This post was written by Jack Borer, a MPGE Senior. He was a part of the team that traveled to Alberta to compete in the Alberta Energy Challenge. Below is a summary of his experiences. 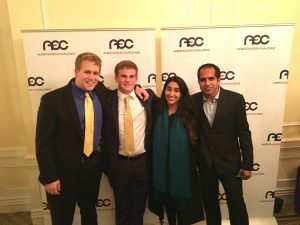 Landon Wright, Najia Bilala, Ishank Gupta and I were given the opportunity by the University of Oklahoma’s MPGE to participate in the Alberta Energy Challenge (AEC). The AEC turned out to be one of the most interesting, dynamic, and formative moments of my undergraduate career. I consider being selected to represent OU at the AEC a great honor and would like to express my gratitude to all the MPGE and AEC members who made this opportunity available to us. The AEC is a case competition that takes place over five days in the city of Edmonton, which is in the heart of the “Texas of the North”, Alberta. A case competition is a timed challenge during which two or more teams develop a solution to solve a business or policy problem that society faces. I will talk about the trip we made to an oil sands operation and then the case competition challenge itself. 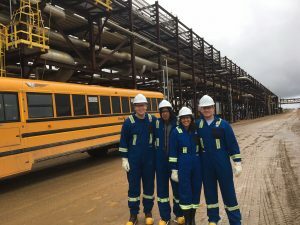 On our second day in Edmonton, we woke up at 5:00 AM to get on a bus headed for the heart of Alberta’s industrial economy: the Athabasca oil sands. The oil sands are a vast natural resource covering an area greater than England in northern Alberta. Over 170 billion barrels of gooey bitumen are locked in permeable and porous unconsolidated sands at depths ranging from one meter to several hundred meters below surface. In the states, we most often associate oil sands with open-pit mines teeming with 400-ton dump trucks and power shovels the size of a large house. In Alberta, however, most of the oil sands, roughly 80%, are too deep to be accessible by strip mining. Remaining deep reserves are produced in-situ with the steam assisted gravity drainage (SAGD) process. MEG Energy’s Christina Lake project is one such in-situ SAGD development. After a five-hour bus ride through endless tracts of boreal forest and featureless muskeg we arrived at MEG’s Christina Lake site. As we stepped off the bus and sauntered into the field office for the site safety orientation, I was expecting to see a rough and tumble crew wearing dirty coveralls and mud-covered boots. Much to my surprise, as I entered the office I was met with a big smile and instructions to take my shoes off. The inside of the building was immaculately clean, well-organized, and had a delicious (and might I say) well deserved lunch waiting for us. 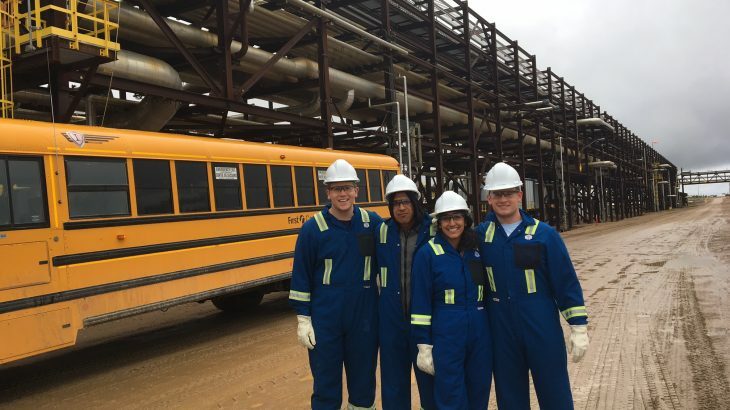 After receiving a briefing on safety protocol, environmental responsibility, and the SAGD process, we were issued PPE and sent on our way to tour the site. Never in my life have I ever seen a more impressive facility. The wellheads were spotless, roads were clean and well kept, production and pipeline facilities were all in perfect working order and the employees had smiles on their faces. Producing over 80,000 BOPD is no small task and being able to be in the middle of the operation, at the heart of the Albertan economy, was a humbling experience. Standing in the warm glow of a steam injection well while learning about one of the world’s greatest industries on a cold and rainy 2°C day in the middle of the Athabasca oil sands is an experience that I will never forget. problem of orphan wells. An orphan is a well that has no legally responsible and/or financially able party to deal with its abandonment and reclamation responsibilities. Due to the current low commodity price environment and recent regulatory changes, Alberta has experienced a huge influx of orphan wells. Over course of 48 hours, all nine teams formulated a strategy to reduce the number of orphan wells. Then, each team presented their solution to a panel of judges from the Albertan energy industry and regulatory bodies including the Alberta Energy Regulator. The Canadian home teams, including University of Alberta, MacEwan University and University of Saskatchewan took first, second, and third, respectively. The AEC is a once-in-a-lifetime experience. Every single day was filled with new and exciting events that showed us what a wonderful place the “Texas of the North” really is. Glad you had a chance to visit the Athabasca Tar Sands while there! Thanks for representing the 100s of students back at the U so well.